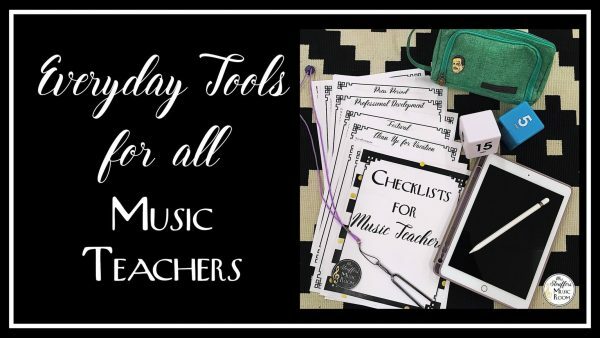 I thought I would talk about some of my favorite tools for music teachers today. These aren’t just for elementary teachers but work really well for those of you with older kids too. All the links to the items I’ll be talking about are at the bottom of the post so you can find them all in one place. I am on my computer all day. Even with kids in the room, I’m projecting stuff that isn’t in Google Drive, playing music that is in iTunes, and in my downtime: attendance, lesson planning, grading, emails…and on and on. 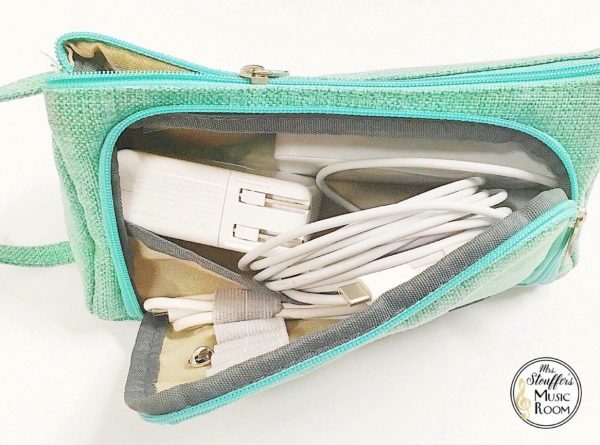 I carry my charger, a portable hard drive and a few random tools in this pencil case I got on Amazon a few weeks ago. It’s awesome because there is a place for pens, a stylus, and two ways to open it. I think I actually need a few more to organize my life! 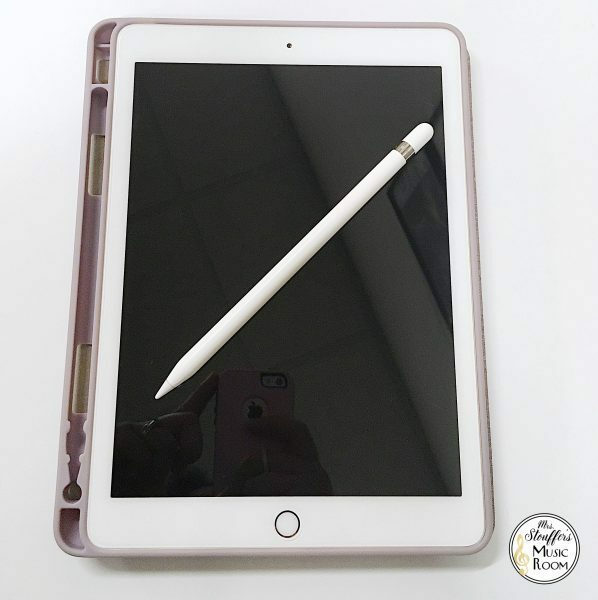 When I’m not on my computer, I use my iPad and Apple Pencil non-stop. What’s great is that I can ActivCast to my new Promethean board (it’s like AirPlay) so that I can show handwritten notes, things that are on my screen, apps, and whatever else I want right from the iPad. The best part for me is taking notes with the Pencil. If I need to jot stuff down during the day, I write it in the Notability app and convert my handwriting to printed text (insert shocked emoji here). I’ve saved so many Post It notes!! And I don’t have them falling out of every pocket of my school bag, purse, sweater, etc as I carry them around trying to get stuff done. I’m sure you know about the iDoceo app. It’s great for assessment, attendance, keeping track of who’s played games recently…totally worth the money! The iPad is also a great way to take note of all those things you need to jot down about students (don’t ActivCast!!). Don’t forget to use a lock code, and if you store that sort of file on the cloud, make sure it’s in a folder that your kids can’t get into via Google Drive on the Promethean board. Speaking of Google Drive. It’s my favorite for school things because I can access it from every device I use. But you already know that! 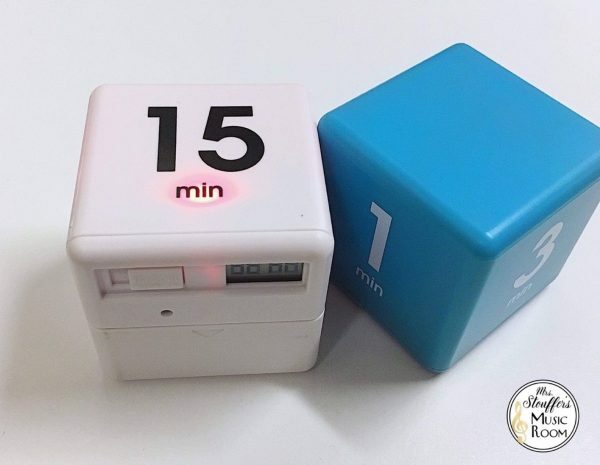 These little cube timers are amazing. If you turn on its side, the number that is up is set as a timer. It beeps at the end of the desired time, and that’s it. No fuss no muss. It’s amazing during a lesson because it helps keep me on track. If we are playing a game I can set the timer and say we are only going to play for so many minutes and when it goes off it’s done. It also is very transparent for your kids if you need to time them. If you don’t want to constantly set a timer on your phone or your board, it’s perfect and FAST. Keep yourself on track when you want to finish something (like lesson plans) in a certain amount of time. Send a kid to a practice room with a timer. Time centers by flipping the cube every time you switch. No fumbling to reset. If a kid needs a time out/moment to calm down. 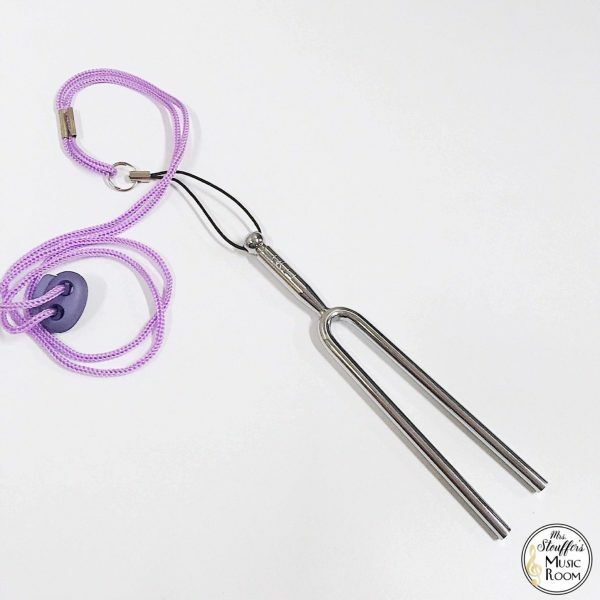 My tuning fork (screaming Kodaly here for a minute). But this can be useful in ANY music room! Give a pitch to a choir – use your ears to find the interval. Don’t be confined to your piano. 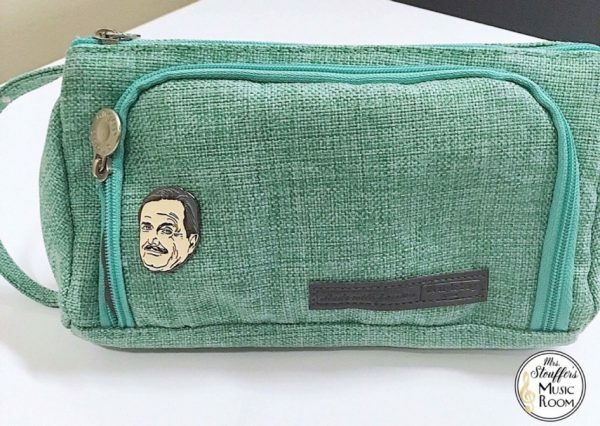 It’s portable, non-electronic, and waterproof. Why don’t you have one for emergencies? 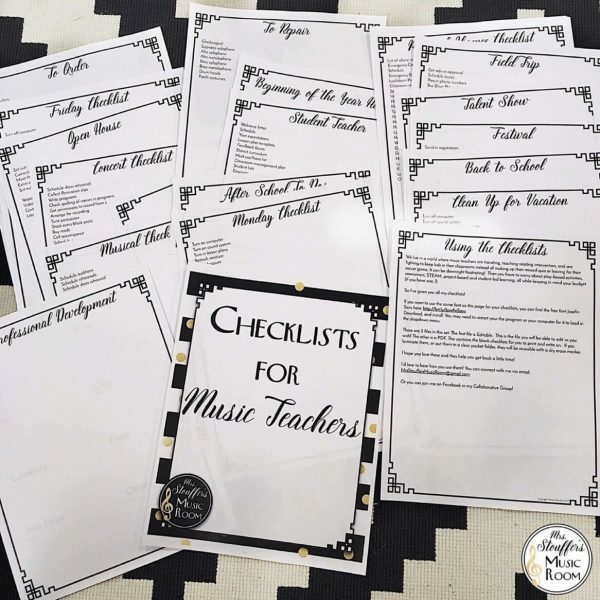 These checklists are one of my favorite tools. I keep the pages I use as separate files so that I can write right on them in my iPad. This is how I store all my to-do lists. I use a PDF annotator (I love PDF Expert), delete the pages I don’t want and save it. I’ve saved different parts of the file as different pages so that I can save them individually. One for the musical, one for my random to-do’s that I jot down during the day so I can add them to To-DoIst later (this app is AMAZING!) and even for different performances such as concerts and festivals. If I have them all stored in one device, it helps so much when I need to pull it up, but what’s great about those PDF readers is that you can save them in the cloud! 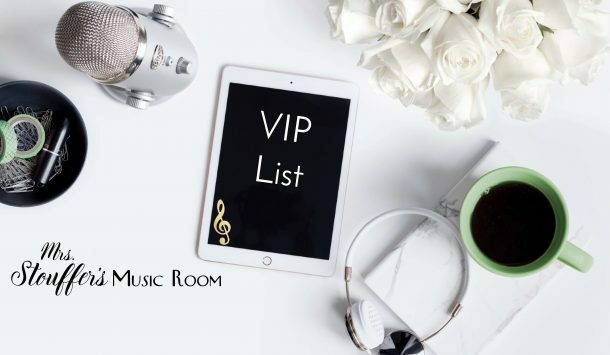 In addition to these great items, I’d like to officially welcome you to try out my brand new YouTube Channel and Podcast, The VIP Music Room. I will be posting all my blog posts now in both places so that you can get great teacher tips the way YOU need. Don’t have time to read often? Listen in the car to my *SHORT* podcasts. My commute is only 10-15 minutes and longer doesn’t work for me, so I want to make sure those of you with a short drive don’t have a lot of listening left over. I like listening and having something to reference while I do because I am usually multitasking (…I know..) so if you are like me, hop over to YouTube to listen and have slides. You can also download the show notes with all the links and ideas I talk about in each blog post. Subscribe to The VIP Music Room TV on Youtube. Subscribe to The VIP Music Room Podcast on iTunes. I hope you find these tools useful! Have a great week!